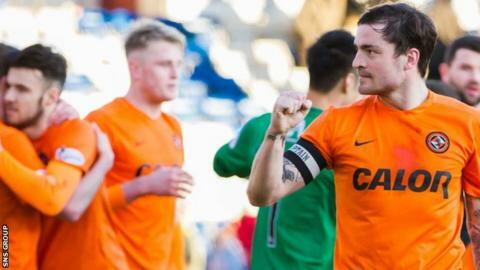 The return of Paul Paton has been a key factor in Dundee United's recent improvement, says striker Billy Mckay. Midfielder Paton, 28, has scored in consecutive victories over Hearts and Ross County to revive hopes of avoiding relegation from the Premiership. "When you have him on your side, no matter what game it is, you feel you have a chance of winning," said Mckay. United are eight points adrift at the foot of the league, with a game in hand on 11th-placed Kilmarnock. Aberdeen visit Tannadice on Wednesday and Mckay is hoping Paton's positive influence can continue. United have won five games in the eight weeks the former Partick Thistle midfielder has been back in the side, which is more than they managed during the duration of his nine-month lay-off with a knee injury. "He's been massive," said Northern Ireland international Mckay. "The results have changed when he's come into the team. "I have played against him before and I know what type of player he is. "He plays full-on in every game and puts 100% passion into every game. You need that in the situation we are in. "He has come in and been brilliant and obviously chipped in with a few goals." A run of 10 points from five games has given United a lift for the end-of-season run-in. "We have beaten teams in the top six, so we feel we can go anywhere and get a result," said Mckay. "We don't have Celtic to play again and we feel we can beat any other team in the league." Manager Mixu Paatelainen echoed Mckay's thoughts on Paton's impact. "Absolute man mountain," he enthused. "The way he talks, the way he carries himself on and off the pitch, he really boosts players' confidence around him. "On the pitch, we all know he's a ball-winner, he's a match-winner. He is so full-hearted. He has been very, very important and we want to make sure he stays fit."